Combined heat and power (CHP) systems generate electricity or mechanical power and useful heat from a single source of energy. The system may take a variety of configurations that include gas-turbine generators (GTGs), heat-recovery steam generators (HRSGs), boilers, and steam-turbine generators (STGs). A gas-turbine CHP plant (Figure 1a) combusts a mixture of fuel gas and air in the combustion chamber of the turbine. The combustion product flows through a series of blades attached to a rotating shaft and generator, which generates both power and hot fluegas that exits through the exhaust system. The high-energy exhaust gas is captured in an HRSG to heat boiler feedwater and produce steam. The steam can be used to drive a STG and produce electricity, which is called a combined cycle; or, it can be sent to a process plant for heating in a heat exchanger or to drive rotating equipment, such as pumps and compressors, which is called cogeneration. ▲Figure 1. (a) Gas-turbine combined heat and power (CHP) plants generate power and hot fluegas from combustion. The fluegas is used to produce steam in a heat-recovery steam generator (HRSG), which can be used for heating, to generate electricity, or to drive rotating equipment. (b) Boiler CHP plants produce steam primarily to drive turbines and produce power, but some steam may be extracted for process heating. 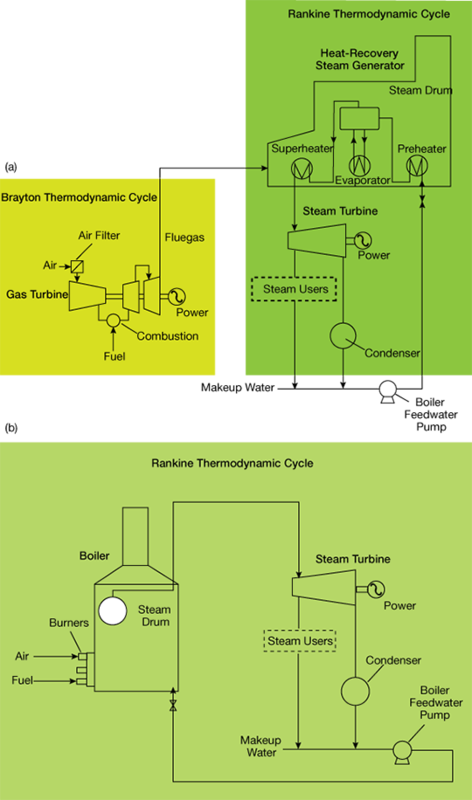 A boiler CHP plant (Figure 1b) is an alternative type of system, in which one or more boilers generates steam. The steam is used to drive STGs for power generation. In some configurations, steam is extracted from the STG for process heating via heat exchangers. This article explains how to develop a CHP model from scratch, using a combination of readily available mixed-integer linear programming (MILP) optimization solver engines, steam property tables, and Microsoft Excel. Solomon Oji is an energy systems engineer in the Process and Control Systems Dept. at Saudi Aramco. He has more than 16 years of industrial experience in equipment selection, planning, and asset management of energy systems. He has experience in energy studies, pinch analysis, process simulation, control and optimization, utility and power generation, gas treatment, gas-oil separation, and liquified natural gas. Oji is a chartered member of the Institution of Chemical Engineers (IChemE), and he holds a BEng and MEng in chemical engineering from the Univ. of Bradford, U.K.
Mana Al-Owaidh is an energy systems engineering consultant working with Saudi Aramco since 2001. He has an MS in energy systems engineering from the Univ. of New South Wales (UNSW), Australia. While earning his master’s, Al-Owaidh developed the methodology of the combined heat and power (CHP) simulation and optimization model, which has been deployed in all Aramco facilities. He is a coauthor of six patents filed in the areas of process and utilities simultaneous design and optimization.